One of the things that my mother-in-law really wanted to see during our trip to Hawaii was the native honu, Hawaiian green sea turtles. After having returned from our trip last year and sharing some of our photos with her, seeing the honu convinced her that we should all make the trip to Hawaii together this year. For me, that meant that Punalu’u Black Sand beach would be on our itinerary. It’s the sight where we first saw honu last year and honu are known to frequent this particular beach. Besides, I figured that if we weren’t lucky enough to see any honu, at least the beach itself is stunning and worth a trip out to on its own. Of course, clever me also figured, if we’re driving from Kona down to Punalu’u, well we have to drive through Na’alehu anyways, we might as well stop. 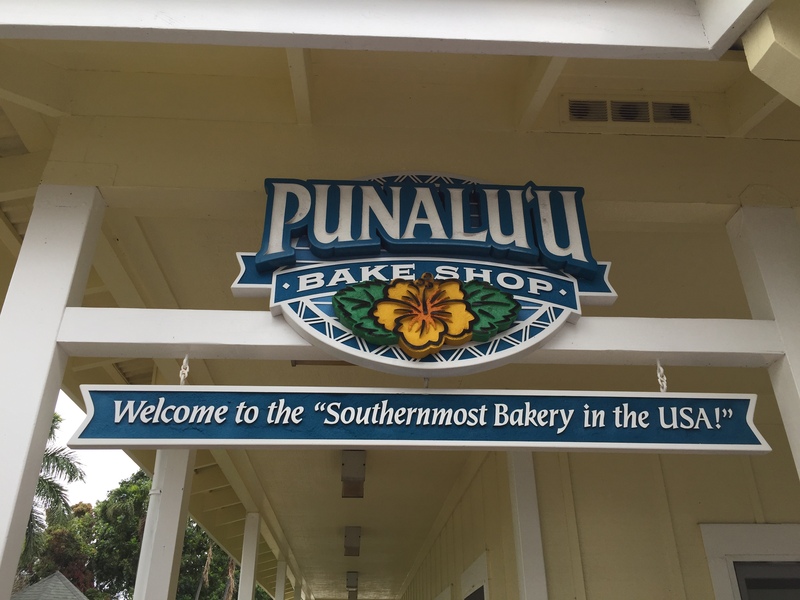 Right in the center of Na’alehu, on the highway, is Punalu’u Bake Shop. 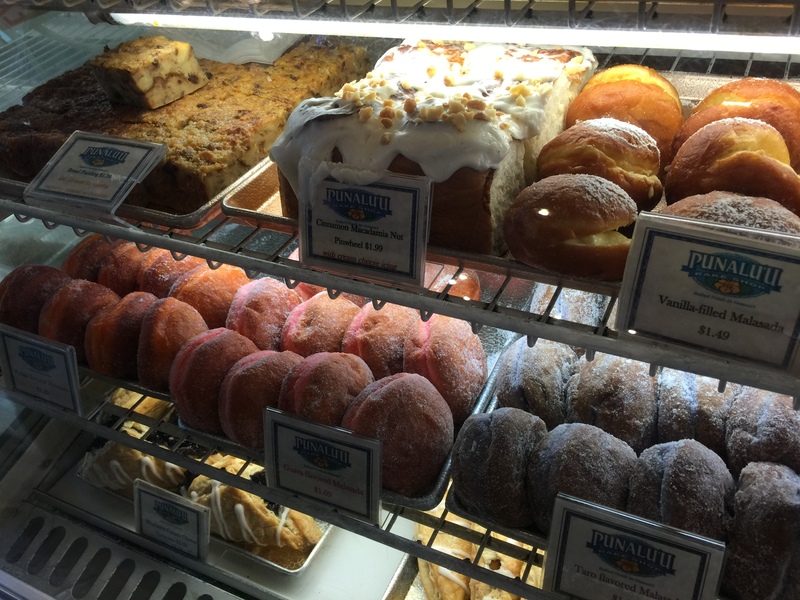 Touted as the “Southernmost Bakery in the USA,” it’s a great stopping point to pick up some refreshments and grab some snacks to take the to beach, or enjoy at the bakery’s outdoor patio garden. My in-laws got a kick out of the fact that they called themselves the “Southernmost Bakery…” Hey, if you can, why not use it as your claim to fame? Since my husband and I had visited Punalu’u Bake Shop last year, I knew what to expect from what they were offering and I pretty much had an idea of what I wanted to pick up. But that doesn’t mean it’s not fun to look at the display case and drool over all of their offerings! 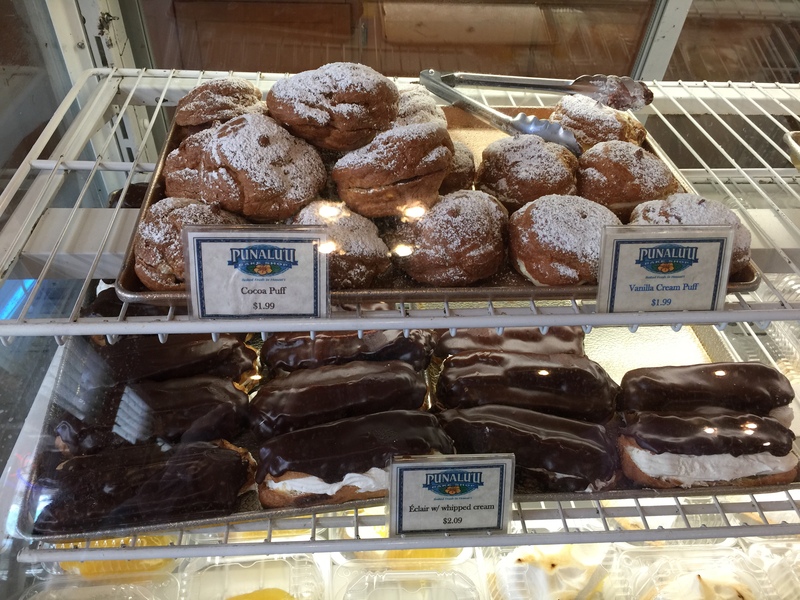 My husband will tell you that I’m the biggest fan ever of cream puffs and eclairs. I rarely pass up a chance to have either of these pastries. It must be something about the combination of the light and airy choux pastry and the creamy filling that I just can’t resist. Cocoa puffs, vanilla cream puffs and eclairs with whipped cream, can I just take home the whole display case? 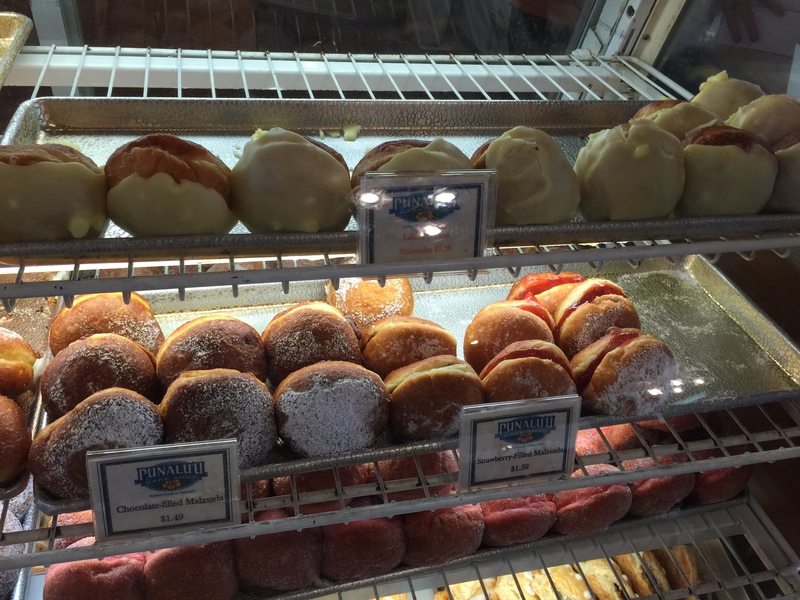 The next case was filled with one of the items that Punalu’u Bake Shop is most known for, their malasadas. Malasadas are essentially Portuguese donuts that are flavored or filled with various fruits and other fillings that are found around the islands. There’s chocolate filled, vanilla filled and strawberry filled malasadas, your traditional malasadas which are just fried and coated in sugar, mango, taro and guava flavored malasadas, and the bakery’s most popular flavor the lilikoi glazed malasada. In addition to malasadas there was also a cinnamon macadamia nut pinwheel with cream cheese icing which seemed to be very popular by the looks of other people in the store that were ordering it. There was also a delicious looking bread pudding and a pineapple turnover along with a blueberry cream cheese turnover. 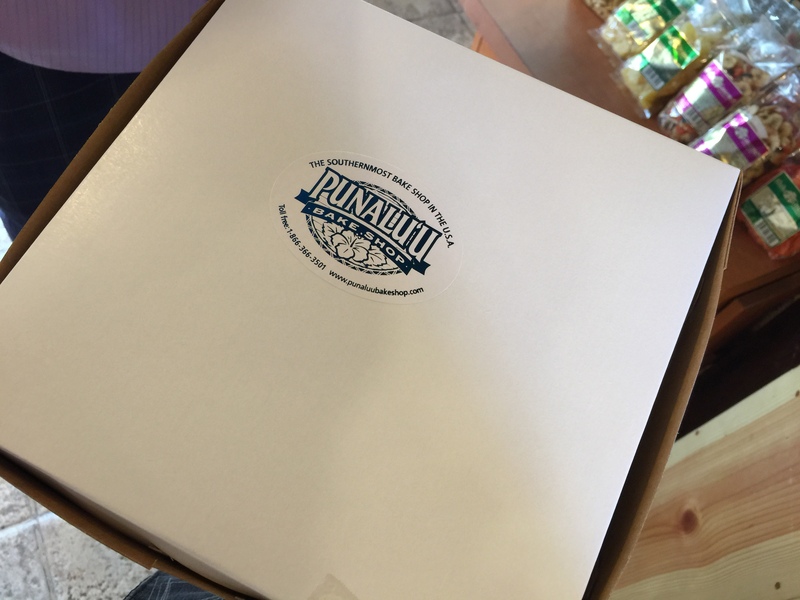 So, I’m sure you figured out by now that there was no way I was leaving Punalu’u Bake Shop without taking home a box of goodies for myself. After all, how could I resist, especially after I was the one who told my husband that we absolutely NEEDED to stop here on our way down to see the turtles at Punalu’u Black Sand Beach. So, the decision wasn’t whether I would get something or not, it was what I should get and how much could I get before I looked like too much of a pig? 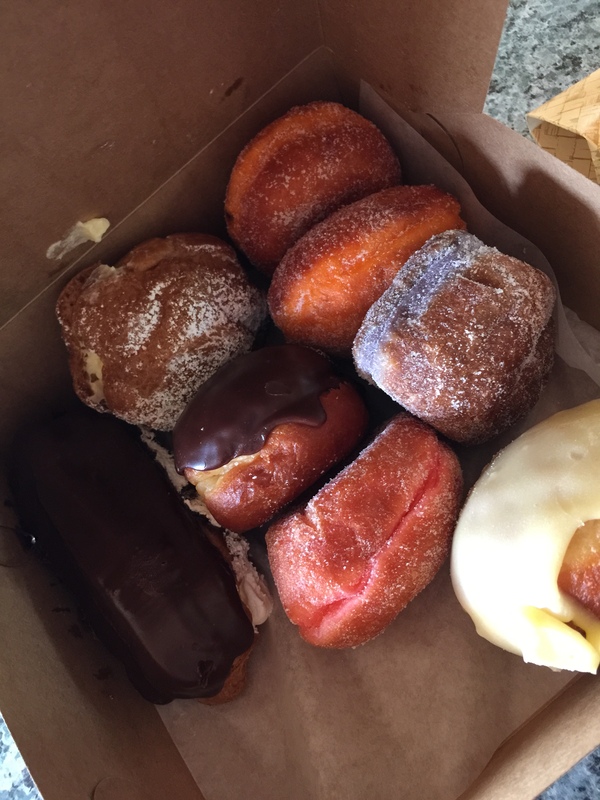 Between my husband and I we tried a few new things that we hadn’t tried last year when we visited Punalu’u Bake Shop, but we also went with some favorites we had from last year as well. After all, if I loved it enough last year to come back for another visit this year, there must have been some items that stuck with me enough that I wanted to try them again! Our box of goodies included an éclair, a Bismarck, a vanilla cream puff, and of course an assortment of malasadas. The malasada choices were mango, taro, guava, and lilikoi glazed. My husband loved the lilikoi glazed so much last year that he needed to have another one. I really enjoyed the éclair and couldn’t pass up another opportunity to have one. While I didn’t get the Bismarck last year, my husband did and said it was so good and I remember being envious of him while he was eating his that I had to get one for myself this year. The vanilla cream puff was also my choice and I am so glad I made it. It was so delicious and yummy. The choux pastry was perfectly baked to a nice light and airy texture and the vanilla cream inside was perfect, there was a good amount of it and it was just slightly vanilla sweetened to provide the perfect flavor combination. The éclair I enjoyed immediately sitting outside in Punalu’u Bake Shop’s outdoor veranda seating area. You can’t ever go wrong with an éclair, and this one was delight and yummy and incredibly light. As before, the lilikoi glazed malazada had the perfect tart and tangy flavor that my husband enjoys and the malasada itself is fried to a great consistency again as to be more light and airy rather than dense and thick. My father-in-law even got himself a scoop of Kona coffee ice cream on a cone and my mother-in-law bought a sandwich that used some of Punalu’u’s special bread that they are also known for, which she found delightful. Punalu’u Bake Shop may be a bit kitschy and gimmicky, especially trying to market themselves with the tagline of being the southernmost bakery in the US. However, while the gimmicks may bring the customers in the door, it’s the bake shop’s products that keep the customers coming back. The store attracts not only tourists on their way to Hawai’i Volcanoes National Park and Punalu’u Black Sand Beach, but it also attracts locals who make the trek here as well. 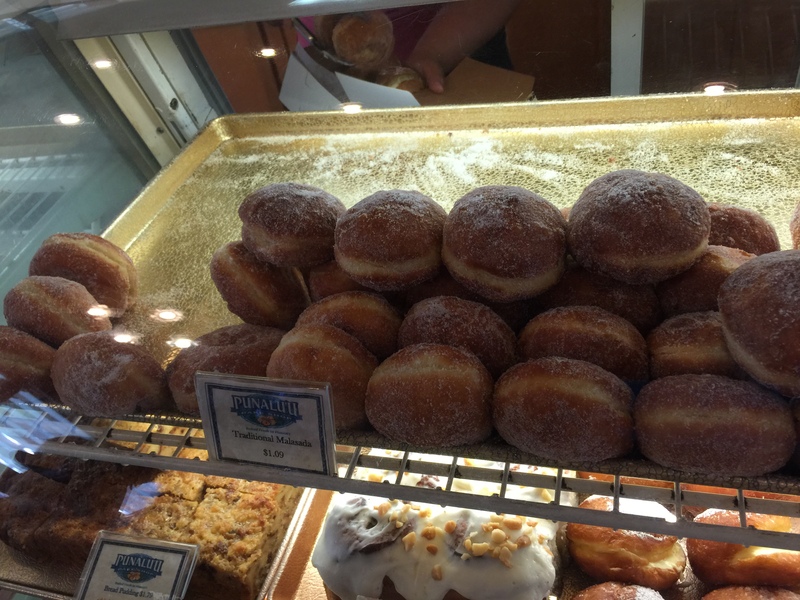 When you’ve got a store filled with locals who come to load up on sweet bread and malasadas, you know you’ve hit the jackpot and found the right place. Good thing I don’t live on the Big Island, or else I could see myself making excuses to visit the bake shop time and time again. I forgot my dad got that Kona coffee ice cream cone that we ended up sharing. We have a long history of sharing ice cream cones. It was good. All their bread there looked and smelled so good, too.